In our latest World IPv6 Launch network operator measurement results, Verizon Wireless have broken through the 50% IPv6 deployment measure for the first time. This is a milestone in IPv6 deployment worth celebrating. Verizon Wireless could soon have company in the top 10 measured networks from another mobile operator that is making great strides in IPv6 deployment. 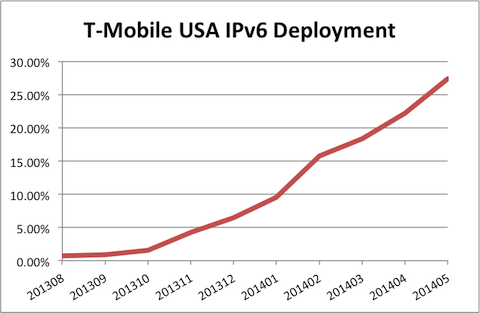 As the chart below shows, T-Mobile USA have been making relentless progress in their IPv6 deployment over recent months. Long may these trends continue!